It seems to be taking a while to get in gear after the Christmas holidays and it's been a sad start to the year - a friend's brother was killed in a car accident, and a relative has died very young of cancer. New Year already involves a bit of reappraisal of priorities, and things like these make you realise that you have to concentrate on the many ways in which you are fortunate, and seize the day. Anyway, with this in mind it seems particularly timely that Lynne has just posted a plea for quilts for the charity Siblings Together. Last year's appeal was an incentive to make my first two full size quilts (if you want to read about them just click on Siblings Together in my Post Categories list in the side bar) and this year it's just what I need to escape the doldrums and I've signed up. It's a great cause, and you can read more about it here. I'm trying to stick to my New Year's resolutions, though the aim of doing something creative every day has so far consisted of adding and painting a wood trim to our new bathroom which took aaages. I seem to be spacially challenged and kept cutting the mitres wrong. Am I the only person who has to lay HSTs on the floor and rotate them until they are in the right position?! So far as getting fit goes, I have now actually got as far as adding running shoes to the sports bra and in the hope that this is not going to be like college textbooks where somehow having bought them seemed enough (maybe if you have them on the shelf you can absorb the contents by osmosis), tomorrow will be the first day of the Couch to 5K program. Wish me luck:-)! So sorry to hear that your New Year has started so sadly Catherine. The timeliness of the Siblings Together Appeal seems so apt. Hope the weather doesn't stop you getting those running shoes on! So sorry to hear of such a start to the year! You're right it does make us reassess our priorities when life seems so fragile. 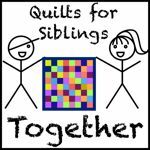 Siblings Together seems a great thing to support with quilting skills! Good luck with the ongoing creativity and fitness project! On another note, maybe you should just wear the workout clothes and see if you get any benefit. Osmosis will work better if the clothes are touching you. :) Good luck! I am so sorry you have had such a sad start to the New Year. Good Luck with the running. It has been a sad start for a friend who lost his young wife to cancer on the 6th and another friend has passed away but lived a full and reasonably long life, life can be challenging sometimes. I will check out that link, and good on you for getting on with the fitness thing, I'm still procrastinating ! I'm sorry to hear that your New Year has started so sadly. I look forward to seeing your Siblings Together quilt! So sorry to hear you had such a sad start to the year. Good luck with the running and getting back on track. Here's to a better 2013 going forward and a good luck with your fitness goal!